Could Electric Trains Run On Long Scenic And Rural Routes? In the UK we have some spectacular scenic rail routes and several long rural lines. The West of England Main Line is an important rail route. The section without electrification between Basingstoke and Exeter St. Davids stations has the following characteristics. It is just over one hundred and twenty miles long. There are thirteen intermediate stations, where the expresses call. The average distance between stations is around nine miles. The longest stretch between stations is the sixteen miles between Basingstoke and Andover stations. The average speed of trains on the line is around forty-four mph. There is high quality 750 VDC third-rail electrification at the London end of the route. The Cumbrian Coast Line encircles the Lake District on the West. The section without electrification between Carnforth and Carlisle stations has the following characteristics. It is around a hundred and fourteen miles long. There are twenty-nine intermediate stations. The average distance between stations is around four miles. The longest stretch between stations is the thirteen miles between Millom and Silecroft stations. The average speed of trains on the line is around thirty-five mph. There is also high standard 25 KVAC electrification at both ends of the line. The Far North Line is one of the most iconic rail routes in the UK. The line has the following characteristics. It is one-hundred-and-seventy-four miles long. There are twenty-three intermediate stations. The average distance between stations is around seven miles. The longest stretch between stations is the thirteen miles between Georgemas Junction and Wick stations. The average speed of trains on the line is around forty mph. The line is without electrification and there is none nearby. The West Highland Line is one of the most iconic rail routes in the UK. The line is without electrification from Craigendoran Junction, which is two miles South of Helensburgh Upper station and the section to the North of the junction, has the following characteristics. It is seventy-eight miles long. There are ten intermediate stations. The average distance between stations is around eight miles. The longest stretch between stations is the twelve miles between Tyndrum Lower and Dalmally stations. The average speed of trains on the line is around thirty-three mph. From Glasgow Queen Street to Craigendoran Junction is electrified with 25 KVAC overhead wires. This is a second branch of the West Highland Line, which runs between Crianlarich and Mallaig stations. It is one hundred and five miles long. There are eighteen intermediate stations. The average distance between stations is around five miles. The longest stretch between stations is the twelve miles between Bridge Of Orchy and Rannoch stations. The average speed of trains on the line is around twenty-five mph. The Heart of Wales Line is one of the most iconic rail routes in the UK. The line is without electrification and the section between Swansea and Shrewsbury stations, has the following characteristics. There are thirty-one intermediate stations. The longest stretch between stations is the thirteen miles between Shrewsbury and Church Stretton stations. The average speed of trains on the line is just under forty mph. There is also no electrification at either end of the line. The Settle and Carlisle Line is one of the most iconic rail routes in the UK. The section without electrification between Skipton and Carlisle stations has the following characteristics. It is just over eighty miles long. There are thirteen intermediate stations. The average distance between stations is around six miles. The longest stretch between stations is the sixteen miles between Gargrave and Hellifield stations. The Tyne Valley Line is an important route between Carlisle and Newcastle stations. The line is without electrification has the following characteristics. It is just over sixty miles long. The longest stretch between stations is the sixteen miles between Carlisle and Haltwhistle stations. The average speed of trains on the line is around mph. The routes seem to fit a pattern, with very similar characteristics. All of these routes are probably important local transport links, that get children to school, many people to large towns for shopping and entertainment and passengers of all ages to see their friends and relatives. Many would have been closed but for strong local opposition several decades ago. Because of the overall rise in passengers in recent years, they are now relatively safe for a couple of decades. Several of these routes are some of the most iconic rail routes in the UK, Europe or even the world and are tourist attractions in their own right. Some of these routes are also, very important in getting tourists to out-of-the-way-places. The average distance between stations on all lines seems to be under ten miles in all cases. This surprised me, but then all these lines were probably built over a hundred years ago to connect people to the expanding railway network. The longest stretch between two stations appears to be sixteen miles. All trains seem to be powered by diesel. This is surely very inappropriate considering that some of the routes go through some of our most peaceful and unspoilt countryside. Most services are run by trains, that are just too small. I know to put a four-car train on, probably doubles the cost, but regularly as I explore these lines, I find that these two-car trains are crammed-full. I once inadvertently took a two-car Class 150 train, that was on its way to Glastonbury for the Festival. There was no space for anything else and as I didn’t want to wait an hour for the next train, I just about got on. Passengers need to be encouraged to take trains to rural events, rather than discouraged. What would be the characteristics of the ideal train for these routes? Without doubt, the trains need to be four-car electric trains with the British Rail standard length of around eighty metres. To broaden the applications, the trains should obviously be capable of running on both 25 KVAC overhead and 750 VDC third-rail electrification. The trains should have at least a 100 mph capability, so they can run on main lines and not hold up other traffic. Unless there is another reason, like a freight terminal, quarry, mine or port, that needs the electrification, using these trains must be possible without any large scale electrification. Obviously, some form of power will be needed to power the trains. Diesel is an obvious no-no but possibly could only be used in a small way as emergency power to get the trains to the next station, if the main power source failed. I have not seen any calculations about the weight, size and power of hydrogen powered trains, although there have been some professional videos. But what worries me about a hydrogen-powered train is that it still needs some sizeable batteries. So do calculations indicate that a hydrogen-powered train is both a realisable train and that it can be produced at an acceptable cost? Who knows? Until, I see the maths published in a respected publication, I will reserve my judgement. A lot of the article takes the form of reporting an interview with Des McKeon, who is Bombardier’s Commercial Director and Global Head of Regional and Intercity. However, Mr McKeon said his view was that diesel engines ‘will be required for many years’ as other power sources do not yet have the required power or efficiency to support inter-city operation at high-speeds. As Bombardier have recently launched the Talent 3 train with batteries that I wrote about in Bombardier Introduces Talent 3 Battery-Operated Train, I would suspect that if anybody knows the merits of hydrogen and battery power, it is Mr. McKeon. So it looks like we’re left with battery power. What could be a problem is that looking at all the example routes is that there is a need to be able to do station-to-station legs upwards of thirteen-sixteen miles. So I will say that the train must be able to do twenty miles on battery power. How Much Battery Capacity Should Be Provided On Each Train? If 200 kWh can be placed under the floor of each car of a rebuilt London Underground D78 Stock, then I think it is reasonable that up to 200 kWh can be placed under the floor of each car of the proposed train. As it would be required that the train didn’t regularly run out of electricity, then I wouldn’t be surprised to see upwards of 800 kWh of battery installed in the train. n an article in the October 2017 Edition of Modern Railways, which is entitled Celling England By The Pound, Ian Walmsley says this in relation to trains running on the Uckfield Branch, which is not very challenging. So if we are aiming for a twenty mile range from a four-car train with an 800 kWh battery, this means that any energy consumption better than 10 kWh will achieve the required range. In the previous section, I showed that the proposed train with a full battery could handle a twenty mile leg between stations. But surely, this means that at every stop, the electricity used on the previous leg must be replenished. In Porterbrook Makes Case For Battery/Electric Bi-Mode Conversion, I calculated the kinetic energy of a four-car Class 350 train, with a full load of passengers, travelling at ninety mph, as 47.1 kWh. So if the train is travelling at a line speed of ninety mph and it is fitted with regenerative braking with an efficiency of eighty percent, 9.4 kWh of energy will be needed for the train to regain line speed. There will also be an energy consumption of between 3 kWh and 5 kWh per vehicle per mile. For the proposed four-car train on a twenty mile trip, this will be between 240 and 400 kWh. This will mean that between 240 and 400 kWh will need to be transferred to the train during a station stop, which will take one minute at most. New trains designed to meet the specification, could obviously be used. But there are a several fleets of modern trains, which are due to be replaced. These trains will be looking for new homes and could be updated to the required battery/electric specification. Greater Anglia – 30 x Class 379 trains. Greater Anglia – 26 x Class 360 trains. London North Western Railway – 77 x Class 350 trains. In Porterbrook Makes Case For Battery/Electric Bi-Mode Conversion, I describe Porterbrook’s plans to convert a number of Class 350 trains to battery/electric trains. These Class 350 Battery/FLEX trains should meet the specification needed to serve the scenic and rural routes. I am led to the conclusion, that it will be possible to design a battery/electric train and charging system, that could introduce electric trains to scenic and rural routes all over the UK, with the exception of Northern Ireland. But even on the island of Ireland, for use both North and South of the border, new trains could be designed and built, that would work on similar principles. I should also say, that Porterbrook with their Class 350 Battery/FLEX train seem to have specfied a train that is needed. Pair it with the right charging system and there will be few no-go areas in mainland UK. One big need with a battery/electric hybrid train, is the need to charge the batteries quickly at a station stop. On my last trip to Sheffield, I timed the stops from brakes on to moving again of the Class 222 train. Times in minutes:seconds were as follows. So it looks like there is only a minute to charge the batteries on a typical Inter-City service. Would it be much longer on say a long rural service like Settle and Carlisle or Inverness to Wick? So how could we top up the train in a station stop of less than a minute. This may work with electric cars, but if you think it would work with trains and charge them in a minute, then think again! This may seem to be the obvious way, but to raise the pantograph, get a reasonable charge into the train’s batteries and lower it again, is an awful lot of things to cram into a minute. There’s also many things that can go wrong. In Issue 864 of Rail Magazine, there is an article entitled Scotland High Among Vivarail’s Targets for Class 230 D-Trains, Vivarail’s solution to charging a battery-powered Class 230 train is disclosed. 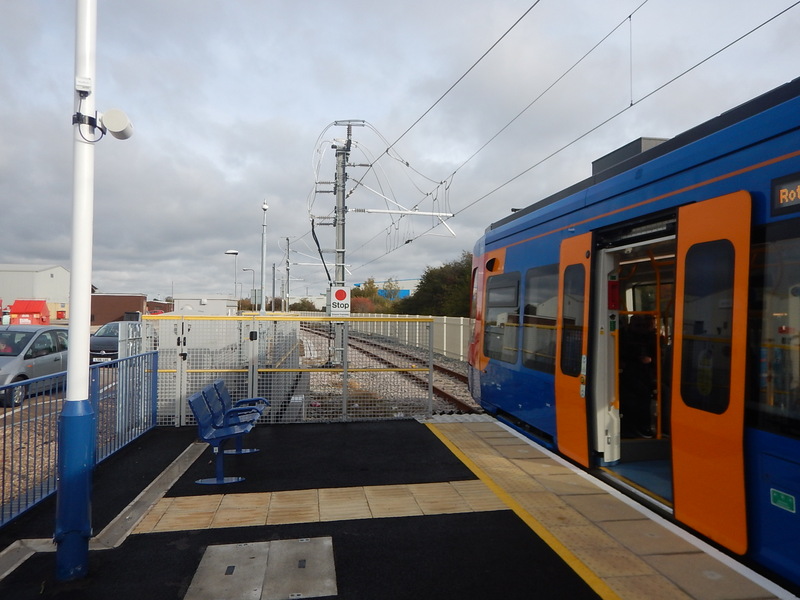 A prototype rapid charging facility at its Long Marston base would use short sections of third-rail to quickly recharge a Class 230’s batteries. He said that the third-rail shoegear fitted to the trains in their London Underground service could handle higher currents than simply plugging a cable into the train. What surprises me, is the claim, that third-rail is such an effective way of charging the batteries. But then a Class 92 locomotive has a power of 4,000 kW when running on 750 VDC third rail electrification, so it would appear third-rail systems can handle large amounts of power. This would be the sequence, as a train performed a station stop. The driver would stop the train at the defined place in the platform, as thousands of train drivers do all over the world, millions of times every day. Once stopped, the contact shoes on the train would be in contact with the third rail, as they would be permanently down and ready to accept electricity at all times. The charging system would detect the stationary train and that the train was connected, and switch on the power supply. to the third-rail. Electricity would flow from the track to the batteries, just as if the train was on a standard third-rail electrified track. If the train’s battery should become full, the train’s system could stop the charging. When passengers had finished leaving and joining the train and it was safe to do so, the driver would start the train and drive it to the next station, after ascertaining, that there was enough power in the batteries. When the charging system determined that the train was moving or that the contact shoe was no longer connected to the third-rail, it would immediately cut the power to the rail and connect it to earth. It is a brilliant system; simple, efficient and fail-safe. Regenerative braking will mean that stopping in the station will help to top-up the batteries. The battery on the train is being charged, as long as it is stationary in the station. Delays in the station have no effect on the charging, except to allow it for longer if the battery can accept more charge. The driver concentrates on driving the train and doesn’t have to do anything to start and stop the charging. As there is no cable to disconnect or pantograph to lower, disconnection from the charging system is automatic and absolute, when the train leaves. The charging system never exposes a live rail to passengers and staff. As a Control and Electrical Engineer, I believe that developments of this system, could be able to put at least 200 kWh into the train’s batteries at each stop. The system could also be independent of the driver, whose only actions would be to check on safety, that charging was proceeding as it should and that there was sufficient charge in the batteries before continuing. These pictures taken at Blackfriars station, show how the ends of the third-rail is tapered, so that the shoe on the train connects and disconnects smoothly. The tapered ends of both rails on opposite side of the gaps. For safety, the electrified third-rail is on the other side of the track to the platform. One picture shows how yellow-painted wood is used for extra safety. As a train is always on top of the third-rail, when the power to the rail is switched on in Vivarail’s charging system, I think that, the system should be very safe. Vivarail’s genius is to transfer the energy from trackside batteries to the batteries on the train. As batteries have a low impedance, large amounts of electricity can be passed quickly. I believe that in a few years time for many applications, supercapacitors will be a viable alternative to batteries. Energy densities are improving in supercapacitors and they have a similar low impedance, which will enable fast transfer of electricity. So I wouldn’t be surprised to supercapacitors used on trains or in charging systems. It may be that a mix of supercapacitors and batteries is the optimal solution. Installation of a Vivarail-style charging system would require. A length of third rail to be installed alongside the track or tracks in the station. The containerised batteries and control system to be installed in a suitable place. Electrical power to be connected to the batteries and control system. Appropriate-cabling between the rail and the container. The great advantage is that to install a charging system in a station would not require any of the complicated and expensive works, often needed to install 25 KVAC overhead electrification. The Rail Magazine article talks of trickle charging the track-side batteries, using mains electricity, but I suspect some of the most cost-effective systems would use solar, wind or water power, backed up by a mains supply. In a remote station, installing a Vivarail-style charging system powered by a sustainable power might be an opportunity to install modern low-energy lights and other equipment at the station, powered from the charging system. Another advantage of using Vivarail-style charging systems, is that there is less visual intrusion than traditional continuous 25 KVAC overhead electrification. Some visual intrusion would be down to the shipping container used to house the batteries. But if necessary, the batteries could be housed in a classic Victorian outhouse or a modern sympathetically-designed structure. Would A Vivarail-Style Charging System Need To Be In A Station? Many, but not all charging systems would be in stations. However, there are some very convenient places for charging systems, that may not be in stations. Trains going to Bedwyn station wait for several minutes in a turnback siding to the West of the station, before returning to London. The route is not electrified and bi-mode Class 800 trains will be used on the route, because there is about thirteen miles between Bedwyn and Newbury without electrification. If a Vivarail-style charging system were to be added to the turnback siding battery/electric trains could work the service to London. I’m sure Hitachi know how to convert a version of a Class 80x train to battery/electric operation. There will be quite a few places, where for operational reasons, a charging system could or should be placed. Would All Stations On A Route Need To Be fitted With A Vivarail-Style Charging System? This would depend on the route and the need to run it reliably. Detailed computer modelling would show, which stations wouldn’t need to be fitted with charging systems! If a train was a limited-stop service or not required to stop at a particular station because of operational reasons or the timetable, the train would just pass through the station. As it didn’t stop, it would not have caused the charging system to switch on power to the third-rail. But if say due to delays caused by an incident meant a train was low on battery power, there is no reason, why the train can’t make a stop at any charging system to top-up the batteries. Should The Driver Have Any Control? It may be extra safety is needed, so the driver could give a signal to the charging system, that it is safe to start the charging process. Similarly, the driver should be able to pause or stop the process at any time. But the driver would mainly be monitoring an automatic process. Would The Charging System Be Linked To The Signalling? I think this could be likely, as this could add another level of safety. I believe it is possible to design a safe charging system using proven third-rail technology and batteries or supercapacitors to transfer at least 200 kWh into a train’s batteries at each stop. I took this picture at the Rotherham Parkgate tram stop. The level step-free access between the Class 399 tram-train and the platform. The platform laid-out to help passengers and meet all regulations. The 25 KVAC overhead electrification. The track continuing into a siding, which could be turned into a loop to extend the service to Doncaster. It certainly appears that Network Rail have produced a professional design that works well and makes things easy for passengers.